I operate a Dvais VantagePro weather station which is connected to a Linux server in my house. A pearl script on the server retrieves data every 5 min, dumps it to SQL and writes a data string out to a text file. The weather station itself is located on my main antenna mast, at a height of around 20 feet. My weather station also sends data to the CWOP/APRS weather network and can be found by searching for it on aprs.fi. The information below updates every 10 min. I also have an IP webcam located on the same mast as my Davis weather station. 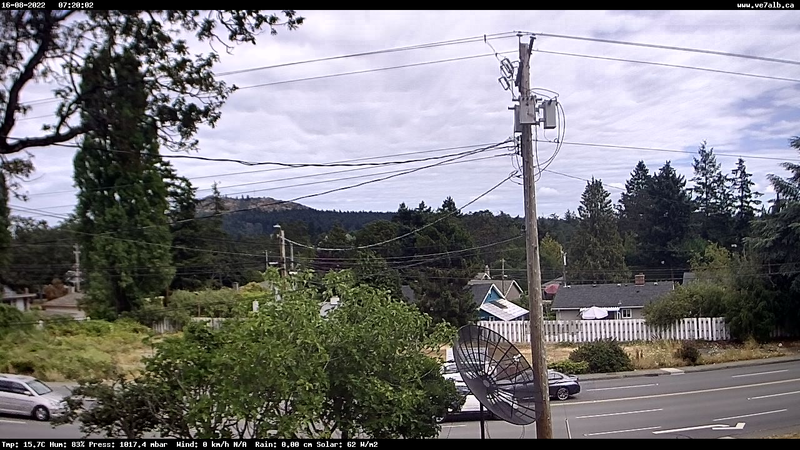 The camera is pointed east towards Mt Doug and offers a decent view of the sky and any incoming weather systems. The camera itself is nothing special - a no-name brand Chinese wifi camera which runs at 640x480 resolution and connects to the network via wifi. Images are retrieved every 10 minutes by a custom PHP script running on my Linux server. The script downloads the latest snapshot from the camera, overlays weather information using PHP-GD and then uploads the resultant image to my public-facing web server via FTP.